Hand Made Zapotec Area Rug (1.5x3), "Diamond-Stars"
The colors of the sky, sea, and earth surround mystical diamond-stars, unique to Zapotec cosmogony. They represent the four cardinal points and their life energies. 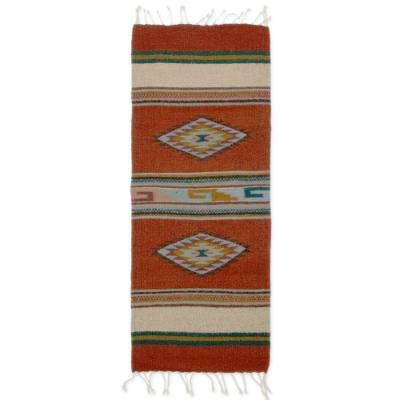 Gregorio Ruíz dyes the wool threads prior to weavings this attractive rug on a traditional loom. I bought this rug for my gas fireplace hearth. It is the perfect size and also is a lovely focal point for the room. I love it! This is the second rug I have bought from Gregorio, and they are beautiful.